Figuring out what to wear to a wedding is one of the most fun—and most trying—parts of being a wedding guest. Sure, you can take your cues from the invitation, but what does "black tie optional" or "festive attire" really mean? And what should you wear to a formal summer wedding that is both stylish and sweat-proof? 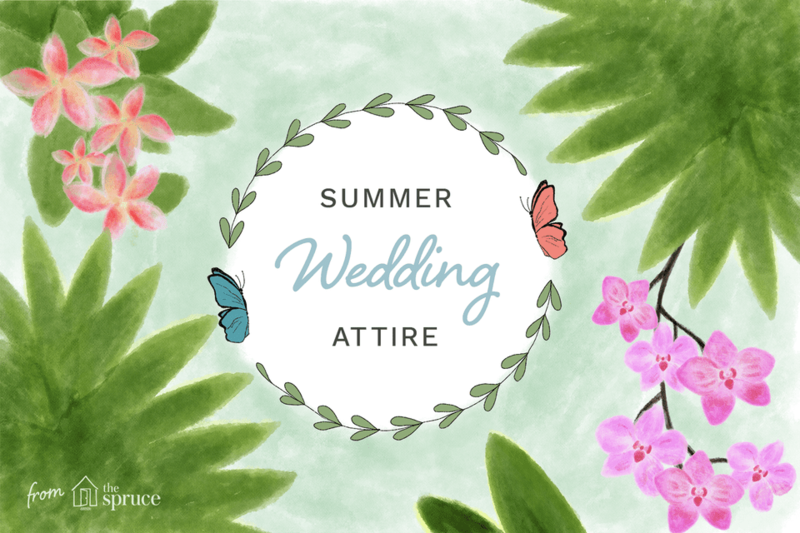 Here are tips and ideas for what to wear for every type of summer wedding. For a casual wedding, you'll want to look fresh and summery. A simple sundress will look just right when you're out in the sunshine. Opt for bright, cheerful colors which will reflect the upbeat atmosphere of a casual daytime wedding. Summer weddings in the garden are generally lovely evenings. You'll want to be just as pretty as the flowers that surround you. There are no general rules for dressing for a garden wedding, other than that is should strike the right note between elegant and not too casual. Garden weddings are usually dressy affairs, but ones for which sequined and beaded dresses are simply too much. If you're invited to a dressy daytime wedding, look for a more polished dress appropriate for either morning or afternoon. For a formal daytime wedding, look for a chic dress with a fun detail, like a beaded neckline or a bright color. You'll look pulled-together and polished without looking office-like. If the wedding is outdoors, a great hat or fascinator would complete the ensemble. If a wedding invitation says "festive attire", look for a cocktail or party dress that will be fun to wear and to dance in. Evening gowns or cocktail dresses in a fun bold color or with an interesting neckline are a great way to go. It's even better if you wear a skirt that swings out on the dance floor. "Black tie" and "religious wedding" don't necessarily go together well. A strapless evening gown will look great at the reception but a little strange and disrespectful in church. For an evening black tie wedding with a church wedding ceremony, look for a stylish dress with covered shoulders or a matching jacket. The jacket helps you be modest in a religious setting, but the dress can include embellishments or ruching so that it will still look interesting if you take the jacket off on the dance floor. A wedding invitation that says "black tie optional" can be the most confusing to receive. Should you wear a formal gown or not? A good middle ground? It's often best to choose a dress with a simple cocktail shape dressed up by elegant beading or other embellishments. For a summer wedding, it's easy and fun and you shouldn't have any problems finding the right one for you. If you're going to an ultra-glamorous black tie wedding, particularly in a major city, you'll want to make sure you look fashion-forward. Choose a dramatic floor-length dress in a fabric that moves with you—like chiffon or jersey. Skip heavier fabrics like satin or taffeta, as they'll look out of place during the hot summer months.